Cute, huh? Our little Rev can be nicer to cats than he is to other dogs!!! 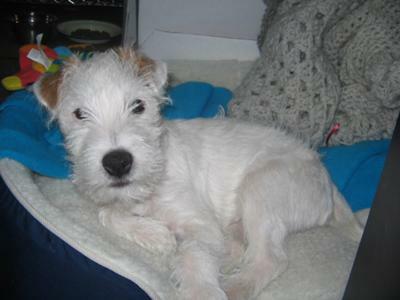 Owners will casually bring their dog over for a greeting on the street when they see this cute little scruffy jack. Aren't they surprised when he leaps and snarls. This doesn't happen to all dogs and there is no rhyme or reason. Usually boxers and golden retrievers (go figure??) and more often when the temps are above 75 degrees. He is a complete gentleman with a Siamese or Tabby though! He accompanies me daily to work and I still don't know how he can tell it is the UPS delivery guy that is coming through the door. He is up and there in a blink of an eye to get his daily treat from the driver. Rev is just 10 months old and a wonderful addition to our family. He is a little detrimental to the garden though. What did we do before he was with us? I can't imagine a day without his wet kisses and bouncy greetings. He is a cutie. Good to know he gets along well with the UPS guy!